I meant to share this when I made it but I got side tracked with other things between then and now. It’s a sunday morning recipe and I’m on the couch with my laptop for a change so it seems appropriate to write it up now. Avocado on toast is not a new concept and neither is a poached egg but it took a zealous bout of emptying the fridge of left 0vers for me to consider combining them. The warm creamy egg turned out to be a happy marriage with the cold creamy and crunchy guacamole and salsa left over from the previous evening’s meal. You could use shop bought or homemade dips but I like the fact that this uses up the smidges left over from a dinner of fajitas that you don’t want to through away. You can also multiply the amounts to feed more people but I tend to make poached eggs only when I’m cooking for one or two so I have written the recipe below to make everything from scratch for one. It occurs to me now that this would make quite an elegant canapé if made with quails eggs and mini toasts if a little to prepare. I love the science behind cooking and find it frustrating to be given an instruction without the reason behind it so it pleases me to know that the freshest eggs make the best poachers because an egg white is made up of what’s called thick and thin whites and the fresher the egg the more thick white it has which holds together better when dropped into the water. So do use fresh eggs if you can, not just for the sake of it. Having said that if you’re cooking for yourself and you wont be offended by an egg with a bit of bed head then dont stress about it if your eggs are a bit older. Mix all your salsa and guacamole ingredients together in two bowls and set side. Bring a pan of salted water to the boil. Crack your egg into a tea cup or small bowl. When the water is ready, stir it with a spoon to make a whirlpool in the middle and drop in the egg. Cook for about 3 min until the white is set but the yoke is still runny. Meanwhile make your toast and spread it first with guacamole and then salsa. When the egg is ready lift it out, drain off the water and place on top of the toast. Sprinkle with salt and serve. My favourite books to read while I’m on holiday are written by chefs about their lives, using a mixture of narrative and recipes to tell the story. I can actually quite happily read a normal cookbook like a novel but I’d have to bring a small library to keep me busy for two weeks so these keep me occupied a little longer and give me a few recipe ideas if I happen to need them. 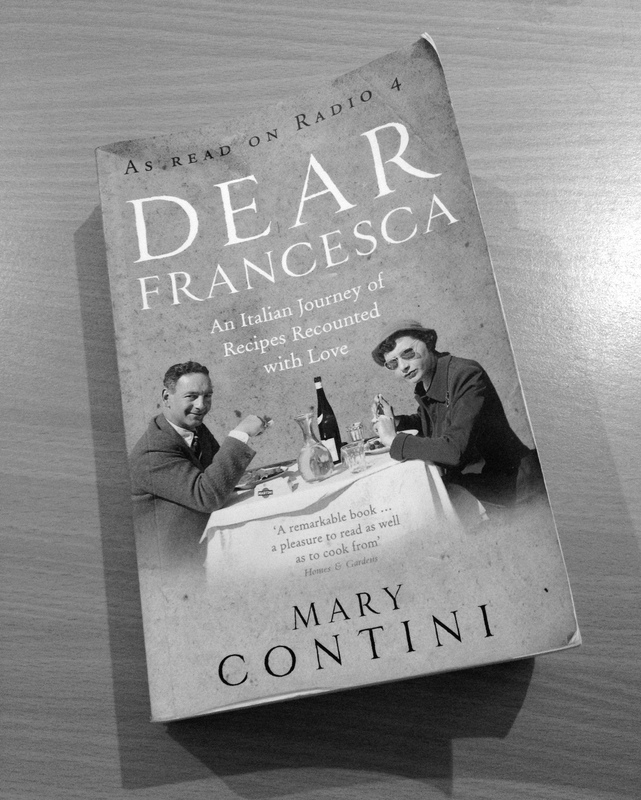 My latest read is Dear Francesca by Mary Contini, the co-owner of the famous Italian delicatessen Valvona & Crolla. Its addressed to her daughter, telling the story of their family and how they came to Edinburgh from Italy. Strangely its the first one of her books Ive read but I loved it and Ive been plowing my way through the recipes since I got back home. 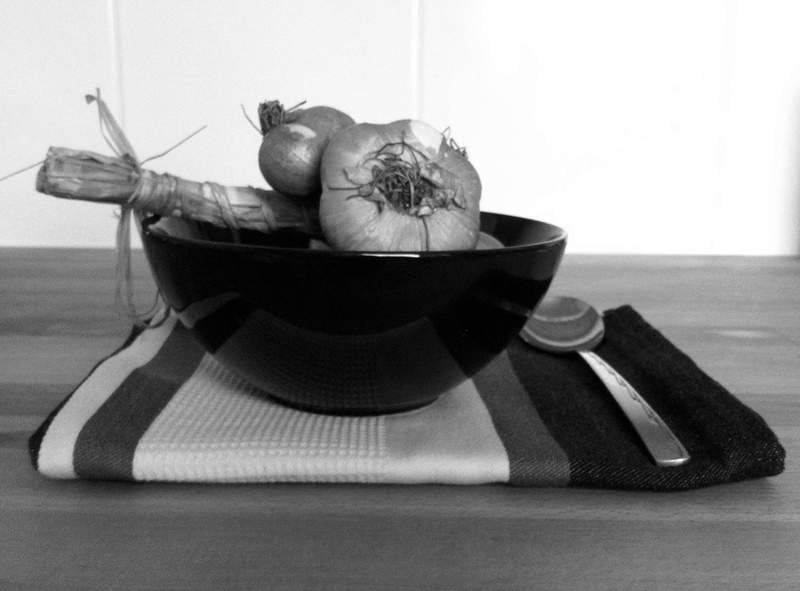 There are some benefits to the Scottish climate… its cold enough to eat soup! Besides a freezer full of soup, I finally got around to trying tomato risotto. I thought Nonna Marietta’s risotto al pomodoro was a pretty good recipe to start with. 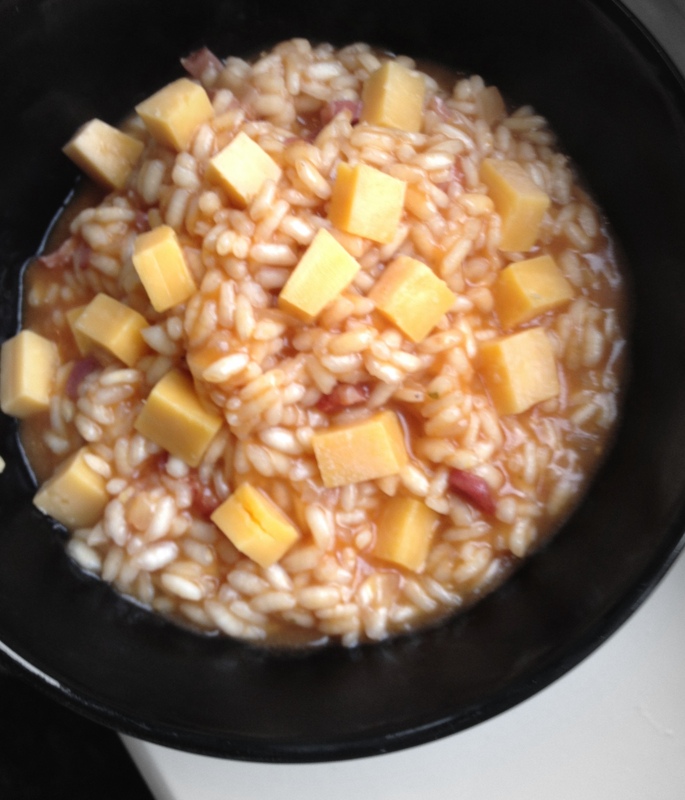 I intended originally to stick to the recipe but I had some mature scottish cheddar in the fridge and thought it would be an interesting alternative to Mary’s suggestion of adding chunks of fontina to the finished dish which melt into stringy pockets as they sit in the risotto. I thought since the book combines dishes from both countries, I wouldn’t be frowned upon by the author if she knew what I was up to. The experiment didn’t disappoint and I am imagining all kinds of variations on my normal risotto recipes that I want to try with different base flavours and cheeses. This could turn into a very fattening winter (yes in case you are still telling yourself summer might turn up before we hit snow again, I hate to break it to you…its not coming). I’ve written out Mary’s recipe with only a couple of small tweaks as I couldnt find a copy on the net but I wholly recommend you buy her book yourself so that you get the Italian mothering and instruction that my version is lacking. Heat the oil and 50g of the butter in a saucepan. Sauté the shallot until softened and transparent. Sauté the pancetta a little and then add the rice and stir around to let it toast. Add the sieved tomatoes and cook for a few minutes. Slowly start to stir in the stock, one ladle at a time. Stir everything and cook for about 20 minutes. When the rice is cooked stir in the remaining butter and divide between two bowls. Sprinkle over the cheddar cubes and gently push them into the rice so that they melt. You could also garnish with fresh herbs such as basil. As you may have realised by this point if you have read any of my other posts I’m a little christmas-mad. I wasnt always this way and I’m not entirely sure what happened but I think it was something to do with moving from the warm southern hemisphere (where christmas day consists of cold meat, salad and a dunk in the pool to maintain a temperature suitable for the continuation of life), to the cold climate of Scotland. I remember the first time I walked past a holly bush in Edinburgh that actually had holly berries on it and did a little jump-squeak-dance on the spot of excitement which must have really scared my fellow pedestrians. You don’t want to see me when it snows. My favourite kind of post to read at this time of year is other blogger’s last minute ideas for christmas dishes, drinks and foodie presents just in case I’ve missed out on something I wont be able to continue life without eating/drinking/owning. And I’m equally as eager to share my own santa list and some recipes so that I am returning the favour to those with a similar compulsion. 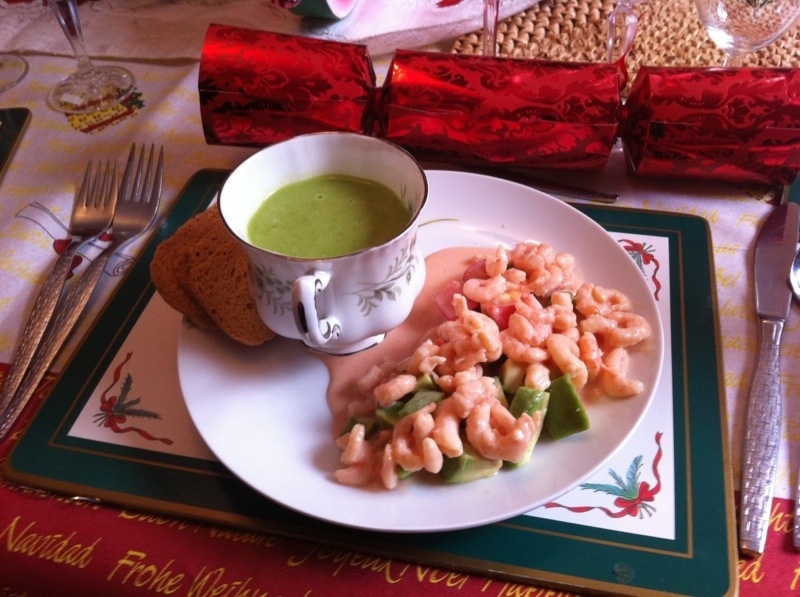 Here’s a selection recipes from other blogs and my own with a Christmassy theme which I would recommend or have me interested. 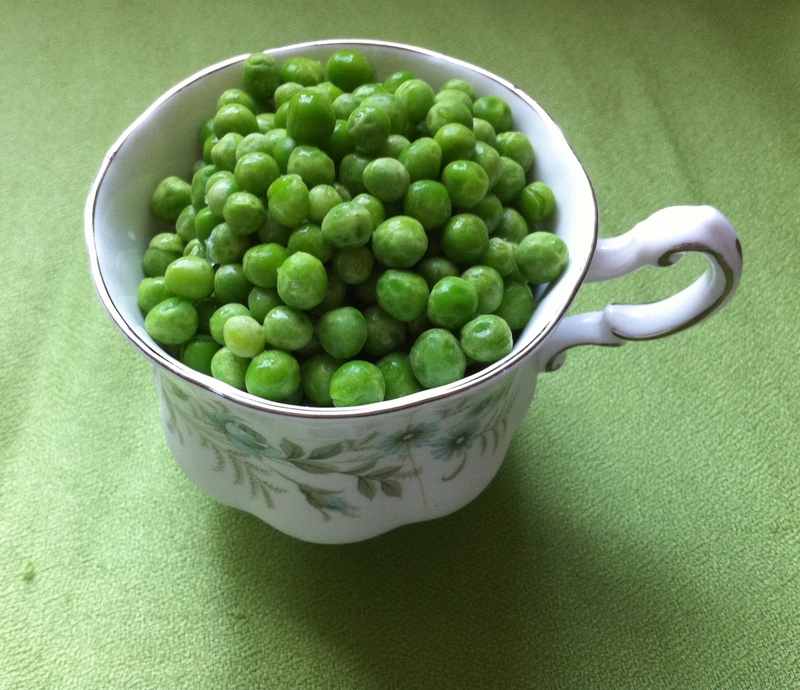 Creamy Pea Soup – coconut milk makes this deliciously creamy and sweet and its the perfect cheerful green…. 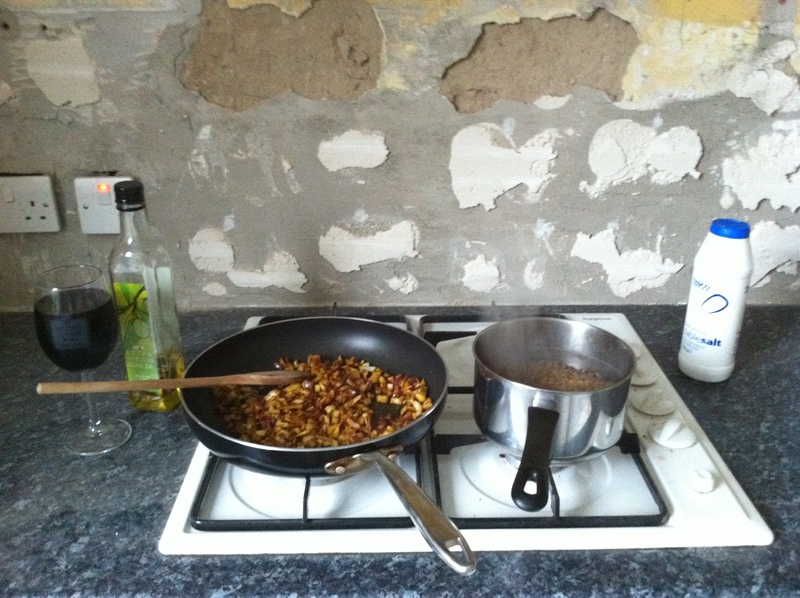 Spaghetti with Marmite (from Nigella) – when you’ve had enough of turkey…. Chocolate & Thyme Mousse – if you’re sick of Christmas pud…. Poached Pears (from Kosher Camembert) – festive and just stunning…. Chilli Glazed Gammon – warm and spicy…. Chestnut Chocolate Pots (from Nigella) – winter in a cup…. Parmesan, Rosemary and Pancetta Grissini – perfect for parties and gifts…. Gingerbread Latte Cupcakes – if Christmas had a smell…. Stomach sorted, presents next. 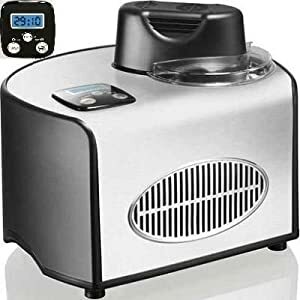 Some ideas from my own Christmas list and other brilliant foodie gift ideas I’ve seen this year. The basics – Stoneware Mixing Jug. Everyone needs a sturdy mixing bowl . I have a big metal one which is great because its light and good for whipping meringue but sometimes you need a heavy one that wont slide around the counter top while you are mixing. 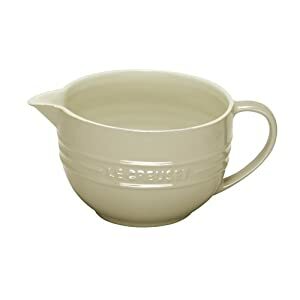 This one has the benefit of a pouring lip and Le Creuset good looks. Cook Books – McGee on Food & Cooking. I love cookbooks that either have a narrative with the recipes or teach you about why you have to do things and the science behind culinary techniques so this book is on my wish list this year. Its not Christmas to me without a good book to read on Christmas day after I’ve eaten so much I’ve lost the power of movement and speech and have to lie down (I know, aren’t I rock and roll). Subscriptions – Kopi Gourmet Coffee. My Delicious Magazine subscription is still one of my favourite presents but this is a subscription with a twist. If you know anyone who loves good coffee and drinks enough of it to receive a new bag every month then I think this is very clever. Crafty – Jam making stuff. I want to start making my own preserves and although I’ve started by making my own fruit mince without the aid of any special equipment its harder to make proper jams and other preserves without decent jars and strainers etc. Every cook loves gadgets. My cupboards are already crammed full but I am dying to make my own ice cream. My head is brimming with recipe ideas but I’ve tried making it without an ice cream machine and it just doesnt come out the same. I dont have space in my freezer or patience for the kind with a bowl you have to freeze so this one is a well priced version of the proper electric kind. And last but not least, don’t forget to join in my Mince Pie Challenge if you are making your own this year. The idea is to reinvent the standard formula with a twist of any kind but if you just want to share your traditional home-made pies you can still send me a link or photo and at the end of the month I’ll post the entries, pick a winner and send the best one a little surprise foodie christmas gift. Just leave me a comment to let me know you are entering by the end of the Month. I’ve started by making Nigella’s Rhubarb and Vanilla Mince which turned out to be delicious and I’m using that to try out different mince pie themed pastries and biscuits. 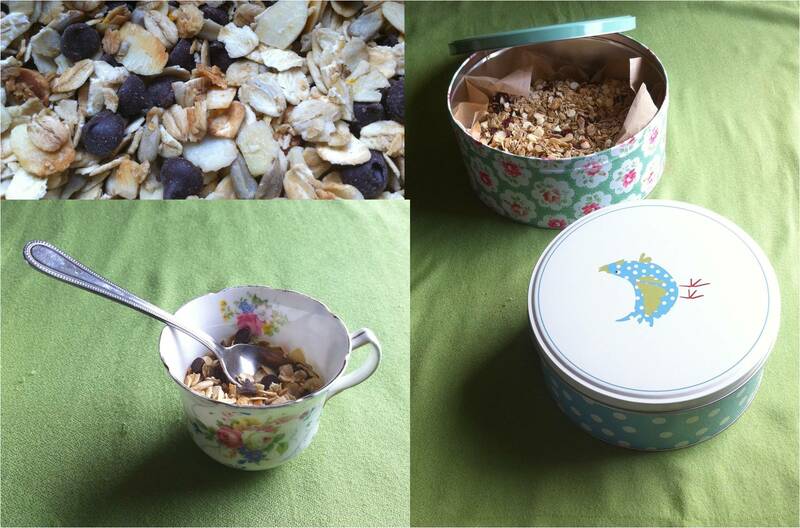 Here’s the recipe if you want an alternative to the ordinary suet and citrus peel kind. The vanilla makes it really rich and velvety. 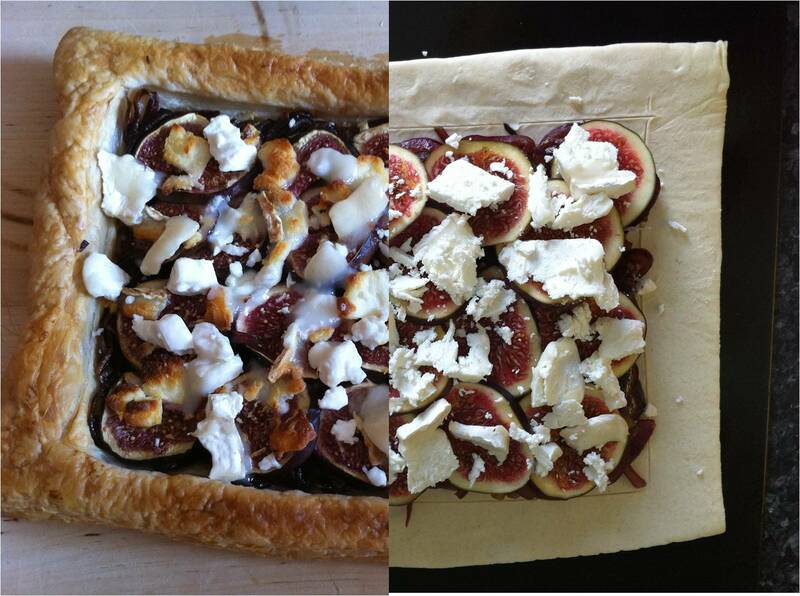 Adapted from Nigella Lawson’s Feast. Put the sliced rhubarb with the sugar into a large pan. Cut the vanilla pod in halves length ways and scrape out the seeds, then cut each half into pieces, adding seeds and pod slices to the pan. Add the mixed spice and cook for about 5 mins. Add the dried fruits and simmer for about 30 mins. Stir in the brandy and take off the heat. When it’s cool enough to handle, bottle in jars. There’s no such thing as too much garlic. Many people will disagree with that statement but tough, I’m writing this blog not you. I would put garlic in my coffee given half a chance. So imagine how excited I was when I found an entire farm shop dedicated solely to this pungent little vegetable. While we were on the Isle of Wight we spent a day driving around the island and since I have a homing beacon for anything food or wine related, I made a bee line for the local vineyards and farm shops…which is how we discovered the Garlic farm. Tucked away on a quiet farm road, you are greeted by a cosy log cabin building with great big baskets of garlic in the doorway wafting their sulphoury sweet fumes into the air. Rows and rows of garlic chutneys, pickles, sauces, marinades, drizzles, and even garlic beer (yes I also thought that was a step too far at first but as I said, no such thing as too much garlic). Just to the left of this alliophile paradise is another even more comfortable looking room with a log fire in the corner, flagstone floors softened with a Persian rug, and slate specials boards dangling tantalisingly from the ceiling advertising the day’s tummy pleasers. Outside is a sheltered terrace where you can eat (weather permitting) with a view of the lawn and the slightly mismatched family of resident peacocks and guinea fowl going about their daily wanderings. The farm is owned by the Boswell family who’s love affair with garlic has lasted more than 30 years and has resulted, luckily for me and other garlic lovers, in a successful farm shop and licensed cafe. I know most people reading this wont be able to just nip down to the Isle of Wight for a nose around so the good news is there’s an online shop as well which sells a selection of the afore mentioned plethora of garlic produce. If you do land up in their neck of the woods though I would seriously recommend lunch in the cafe. The head chef, Charlie Bartlett, must know what he’s doing because I had such a scrumptious lunch that I came back for a second one before we left. 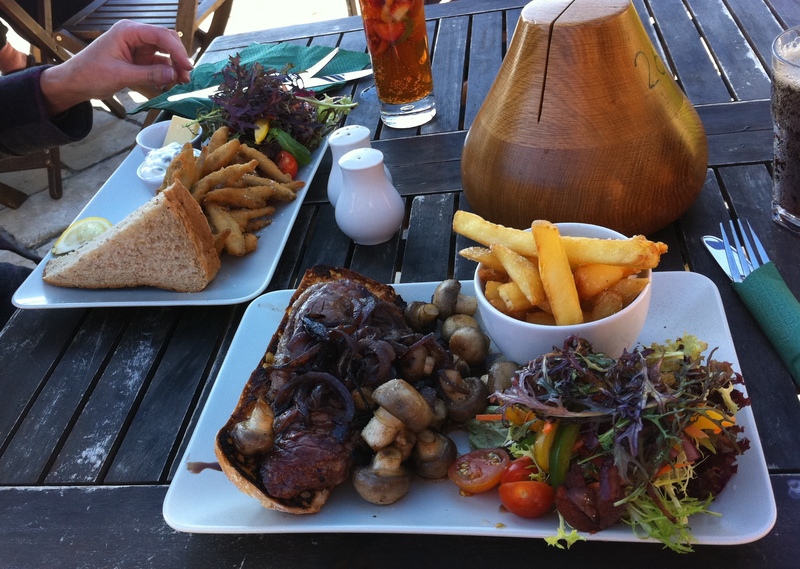 On our first visit the sun was out so we sat on the terrace and munched our way through a plate of crispy fried whitebait with home made tartare sauce and malted bloomer bread door stopper and the most delicious and tender steak sandwich I have ever tasted. For round two, I had the trout and spring onion pot with garlic croutons, side salad and a balsamic dressing and Ross had the beef stew with dumplings, no disappointments there. Delicious. Having been let loose in the shop I came home with a bag full of loot, including the garlic farm cookbook and a bundle of smoked garlic, so the first thing I did when I was back in my own kitchen was cook something. The weather here was pretty miserable (a common theme you will have noticed) so I chose a roasted garlic soup recipe with potatoes and leeks but instead of the elephant garlic it called for I decided to try the smoked garlic bulbs so that they would be the star of the show. Despite the eye watering aroma coming from the brown paper bag they were stored in, the smoked cloves are very mellow and sweet so I chopped and added a few extra cloves near the end as well as roasting the whole bulbs in the oven for a proper garlic bite. You can adjust the amount and type of garlic in this recipe to suit your own tastes as long as you remember the following rule. The finer you chop the garlic and the less time you cook it the stronger the flavour will be. If you keep the cloves whole and roast them they will be much gentler with a more caramelised flavour. Pumpkins aside, you couldn’t get a more appropriate recipe for Halloween than this and you can be safe in the knowledge that no vampires (or co-workers, family and friends for that matter) will come near you with a bowl of this in your tummy. Adapted from the Garlic Farm Cookbook. Serves 4-6. Preheat the oven to 220°C. Cut the top off the garlic bulbs so that the flesh is exposed, drizzle with olive oil and wrap in tin foil. Roast for 1 hour until soft and golden. Squeeze the flesh from each clove into a pan and add the onion, celery leeks and potatoes and a dash more olive oil. Fry for a couple of minutes, then add the wine and cook until the wine has reduced by half. add the stock, salt and pepper and simmer for 30 minutes, stirring occasionally. Near the end, add the chopped garlic cloves. While the soup is cooking, gently fry the sage leaves in a large frying pan for a minute. Cut the crusts off the bread and make into sandwiches with the parmesan and a couple of sage leaves. Then carefully place them into the same frying pan and squash down with a spatula. Fry until golden on each side and cheese has melted. When the soup is ready take it off the heat and blend with a hand held blender or in a food processor and then serve with the cheese toasties and garnished with the remaining sage leaves. 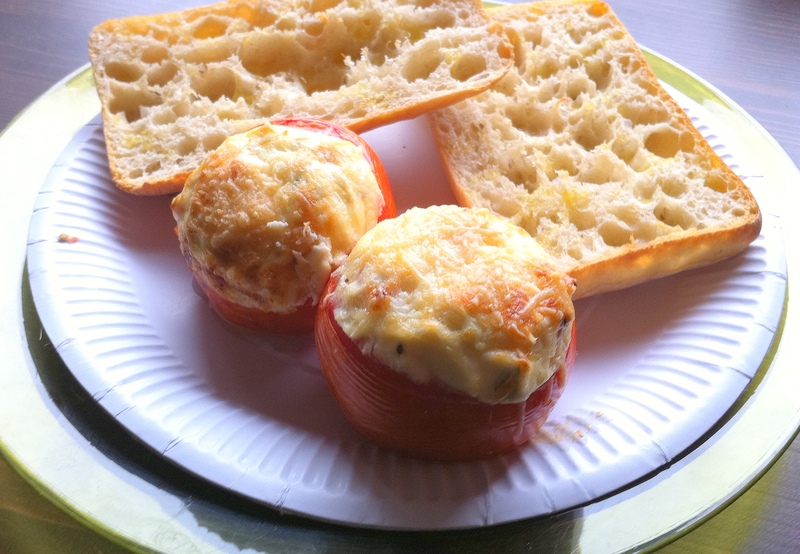 I made these ricotta stuffed tomatoes today for lunch from Aimee Lee’s blog “Cooking my way thin” and they were delicious! It was cold and grey outside and I was working from home while the joiners came to start renovating our kitchen so I decided to make something hot for lunch. I didn’t have any beef tomatoes and I was cooking for one so I made two baby ones without the corn and courgettes and had them on toasted ciabatta drizzled with balsamic syrup. They look just like little red and white baubles so I think I’ll keep the recipe to use again as a starter at Christmas time! Today is the last time I’ll be able to cook this week as tomorrow the sink and oven will be ripped out so as a final treat I’m making Bunny Chows for dinner tonight. A Bunny Chow is essentially curry served in a hollowed out loaf of bread and is a South African fast food staple (if you want to know more about the history you can read this Wikipedia article). The magic thing about a bunny is that the bread doubles as a bowl for the curry and your side dish. You just pull bits of bread off and dunk them in the curry as you go, functional and delicious! I’m not attempting to make the bread tonight because most of my cooking utensils are packed away but this is the one I was going to use from Barefoot Kitchen Witch. I made it with soup a few weeks ago and its perfect – soft but strong enough to hold the curry and you can make it ahead of time (thank you BKW!). I’ve included two curry recipes that I’ve written: Chicken and Lentil. I’m making the lentil one tonight but they’re both just as nice. This is a rich creamy curry but you can make it slightly lighter by replacing the coconut milk with extra yoghurt at the end. Serves 2-4 people depending on the size of your tummy! Gently heat the oil in a large pan and toast the spices for 1 min. Add the onion, ginger and chilli and fry for 2 min. Add the garlic and fry for a further minute. Add the chicken and fry for 4 min, then add the wine, cook off and turn down the heat. Add the coconut milk and simmer for 15 min. Turn off the heat, stir in the coriander and yoghurt and serve (stir the yoghurt in carefully otherwise it will curdle). This is quite a light curry, especially with the fresh tomato and spring onions tossed through at the end. Serves 2-3. Chop 2 of the tomatoes, the spring onions and the coriander and set aside. Boil the lentils for about 20 min until soft but not mushy. In the meantime toast the spices in the oil and then fry the onion and chilli for 5 min. Add the tomato puree and fry for another 2 min. Add the wine and cook off. Add the remaining chopped tomato, the stock cube and half a cup of water. Add the drained lentils and simmer for 20 min. Turn off the heat and stir in the yoghurt. Finally mix in the fresh tomato, spring onions and coriander and serve. Cut the loaf of bread in half and hollow out the middle. Put the core to one side. Spoon hot curry into the middle of the loaf and put the core back in the top. Serve on its own or with chutney and sambals.